As someone who owns approximately 347 notebooks, I should be better at writing things down. I’ve kept virtually every kind of journal possible—goal planners, meal trackers, sleep logs, and bullet journals are scattered through my collection—though I could never quite maintain one with ongoing regularity. I had virtually given up any ambition to maintain any kind of productivity-driven written record—save for my daily to-do list—until I came upon a different concept: the wellness journal. The one that caught my attention was recently released by Ban.do and features sections to record emotions, physical well-being, water intake, and more. Its approach to wellness is holistic and it isn’t routed in numbers—you won’t find nary a calorie tracker here. I was lured in by its pretty patterned pages and encouraging mantras. After using it for a week, I was won over by the way it helped me understand my own body. Here’s what I learned over the course of seven days. I’ve never really been concerned about whether or not I drink enough water: When I’m at my desk or hanging out at home, I always have a glass of water, a cup of tea, or a can of seltzer on hand. When I started actually logging how much I was drinking (using an extra-handy water bottle with measurements), I filled out my chart with rapid pace, frequently getting up from my desk to refill my bottle (and, yes, to make a bathroom run). The workweek went swimmingly in terms of my hydration, and then, the weekend came. I had been logging my wellness progress on days when I had a relatively set schedule, but a Saturday jaunt around town left me feeling thirsty. Staying hydrated was a priority for me—though clearly not enough of a priority to inspire me to bring a water bottle along on my schlep to SoHo. Admittedly, this is something I’ve come to know very well in the past few months. My biggest resolution for 2019 was to start meal-prepping, which typically involves putting together a physical, pen-on-paper grocery list and trying out new recipes. Even though I don’t meal-prep every single weekend, I’ve learned that a bit of planning goes a long way. The week I kept my wellness journal, I hadn’t successfully meal-prepped, but writing down my daily food plans made me far less stressed when it came to meal time. One day, I knew to order my Sweetgreen salad at 10:30 am for pickup at 1 pm so I could manage to skip the lunchtime-ordering rush. On another day, I made a vegetarian bolognese sauce with Trader Joes’s vegetarian ground beef and pasta sauce and noted in my journal which days I should enjoy the leftovers. If I happened to get home from work late one night, there was no panic about what to order on Seamless or what to pick up at my corner grocery store—I had thought ahead, and that made a world of difference. There are some wellness trackers that I’ve long resolved to ignore: those that concentrate on calories, food diaries, steps walked, hours slept, and more. 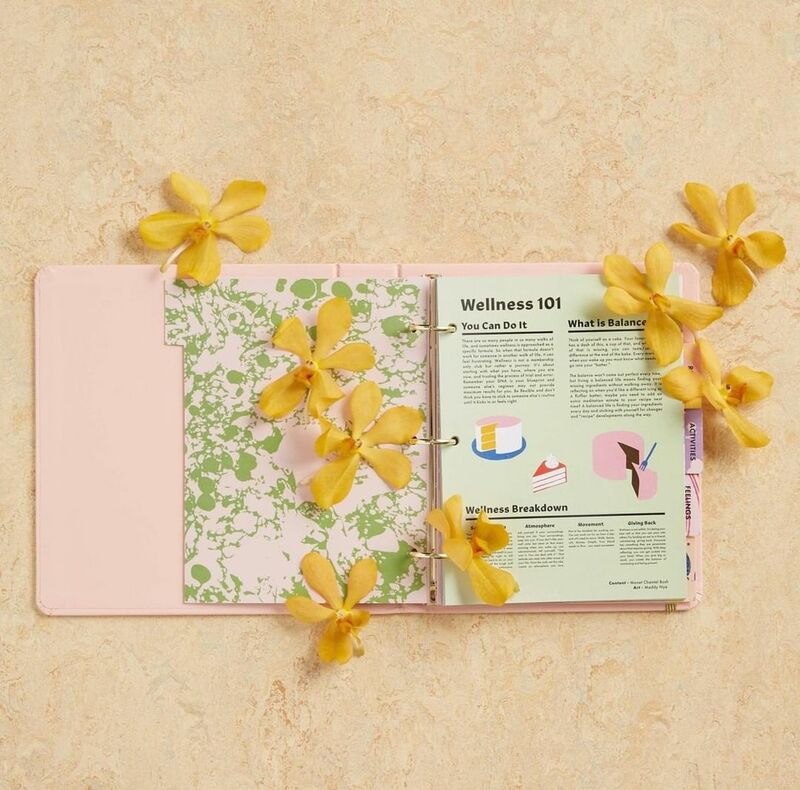 The way I approached my new wellness journal wasn’t about quantifying my health—it was about doing things that I knew would help me in the long run. Rifle Paper Co. / Rifle Paper Co. When I wrote my food plan for each day, I did so with flexibility. If there happened to be a birthday in the office, who was I to turn down a midday snack? Even when I logged my water intake, I noted each measurement like I was giving myself a pat on the back—not painstakingly pushing myself to reach a goal. There are many ways in which stress can affect your physical health, and ignoring that stress, unfortunately, does not make lessen its impact. In my week of journaling, I realized that I had a go-to set of behaviors for virtually every kind of bad feeling. Tired? Drink some coffee. Stressed? Treat yourself at lunch. Have a headache? Pop some Advil. I did these things constantly. Then, I realized that I wasn’t ever getting to the root of the problem. My methods for tackling the physical embodiments of my stress aimed to put a bandaid on my mental state. Until I found myself writing down how I felt at the end of each day, I hadn’t considered other options that would, ultimately, make me feel better: go to bed earlier, switch to tea instead of coffee during the day, have a salad if I’m feeling sluggish, and actually sign up for yoga class for once. Research conducted at Harvard shows that writing about stress can help to abate it. While this research specifically looks at people who have endured a traumatic or particularly stressful life event, it holds true for daily stressors. When you acknowledge what you feel, it becomes easier to process it. And once you process it, that’s when the healing really begins. Wellness is about feeling good, and that means confronting what’s making you feel bad head-on.